Staff, students’ union representatives and students from Wrexham Glyndwr University got together for a lunch time cycle ride around Wrexham today. The event was part of a 12-day programme of events around the university’s campuses to mark Go Green Week and Fairtrade Fortnight. 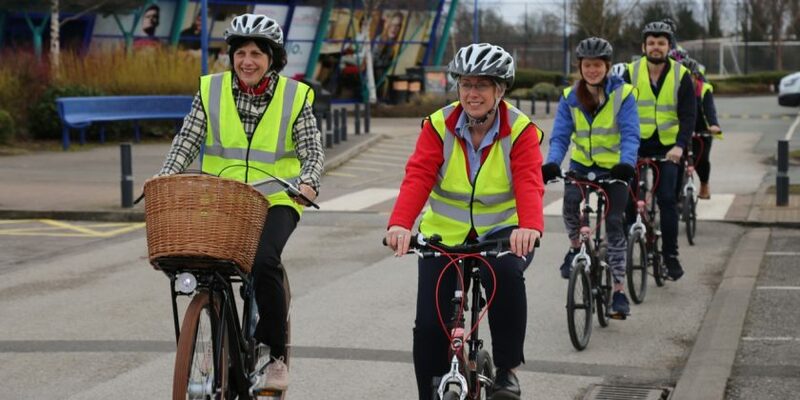 Leading the bike ride were Wrexham Glyndwr University Vice Chancellor Maria Hinfelaar and event organiser Claire Doran, Senior Safety, Health and Environment Officer. Professor Hinfelaar said: “We’re promoting healthy living and the importance of getting out at lunch time for a quick cycle – even if it’s only quarter of an hour it’s absolutely worth it. Claire Doran said: “Bikes are a clean and healthy way of getting around, and the university has bikes students and staff can hire from the Sports Hall. “The university is also a supporter of the employee benefit scheme Cycle to Work.